I will be attending the Outside Lands concert this weekend. For those who haven't heard of it, it's a huge concert in Golden Gate Park in San Francisco featuring bands like Radio Head, Beck, Ben Harper, Wide Spread Panic, Drive By Truckers, and dozens others. 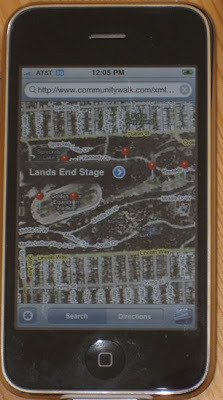 I also recently got a 3G IPhone with GPS so I've been looking for an easy way to take advantage of CommunityWalk with the IPhone to give me a custom map to find my way between stages at the concert. and I figured out a way to get this to show up in the Google Maps application on the IPhone so that I can take advantage of the GPS. So just click the link and then add a colon after the "http" and hit search.